Now this is funny! Keep those images coming....the contest ends Aug. 31, 2007. Please also keep in mind that I will NOT be judging. To keep things fair I have a panel of judges that will be either choosing the winner or choosing finalists and then I may post a vote on my blog (depends on the number of entries). I have had a couple clients worried about me choosing the winner....I of course know all my clients so that would not be fair to everyone. So no worries....I had already taken care of that! For anyone who does not know about the contest....We are having a funny face contest. 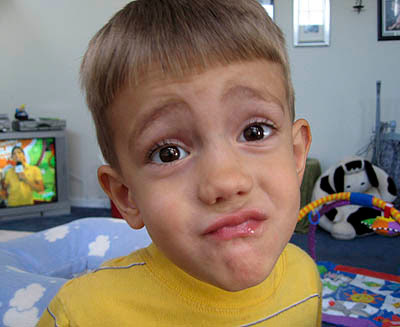 All I need is for you to email me the funniest face your child can make! The winner will receive a funny face session with a collage of 9 images in a frame. If you have any questions please let me know! Good Luck!